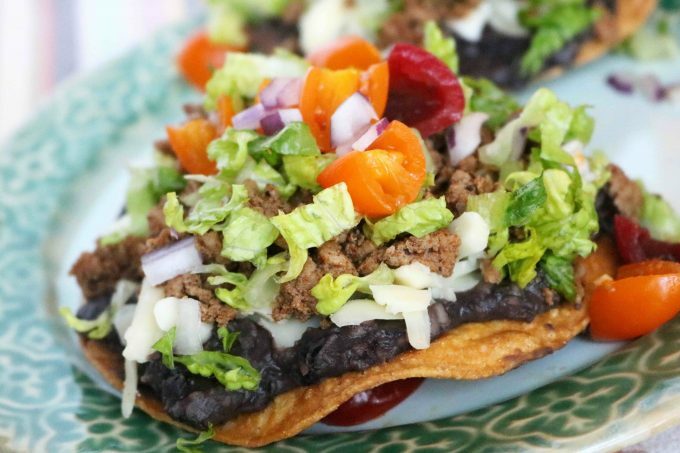 A quick and easy Tex-Mex dinner idea, featuring ground turkey taco meat, a black bean puree, Monterrey Jack cheese and fresh vegetables. I’ll be totally honest with you. This recipe was created on a whim, out of dinnertime desperation. You ever have those kind of days where life has truly sucked every ounce of energy out of you, and you long for the moment when you get to curl up under covers and rest your pretty head? Yeah, it was one of those days. The husband was out of town, the kids were crazy and I needed mealtime to be over and done with so that I could plop those kiddos in the bath, tuck ’em in night-night and go position myself face-down on a pillow. I absolutely did not have it in me to convince a two-year-old to eat her vegetables. I needed a dinnertime option that was not only going to be a quick-fix, but also kid-friendly. I was so glad to see a package of ground turkey just sitting on the shelf waiting to be used. Ground meat is always a quick-fix. 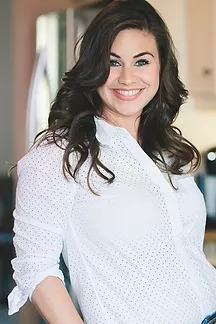 It is a staple on our grocery list and a total necessity for this busy mom of two. Black beans are also always on the list. We probably eat some form of Tex-Mex in our house at least once a week, and not only do both the kids and adults love black beans, but they’re quick to make and require very little effort to spruce up. The lightbulb went off when I spotted the corn tortillas, yet another TAK staple…I mean cause, come on, you just never know when you’re going to need a batch of enchiladas. It was tostadas to the rescue. I threw the ground turkey in the pan with a little TAK’s Tex-Mex Spice Blend (yet another staple — are you also seeing a common theme, here? ), gave the black beans a quick mash with the back of a wooden spoon and fried up a few corn tortillas lickety-split. I even took the extra time to chop up a few veggies for myself. Dinner was served, and dinner was very much enjoyed. So much so, that my girls and I had ourselves a little slow-down at the table, giggled, ate and enjoyed. Have ready a rimmed baking sheet lined with paper towels. Add 3/4 cup Canola oil to the cleaned skillet and place over medium-high heat. Allow oil to come to temperature. Add 2-3 tortillas to the oil at a time, taking care not to overcrowd the pan. Cook for 30-45 seconds on each side, until golden brown and crispy. Add 2 tablespoons of Canola oil to a large skillet over medium-high heat. Add the turkey and sprinkle over the seasoning. Break apart the meat and saute for 6-8 minutes, or until fully cooked. Transfer turkey to a separate bowl using a slotted spoon, and set aside until ready to use. Clean the skillet and set aside. In a saucepan over medium heat, add the beans, cumin, paprika, salt and pepper. Allow to rapidly simmer for 5 minutes, stirring occasionally. Set aside to cool slightly. Set on the paper towels to absorb excess grease. Using a potato masher or the back of a wooden spoon, crush the black beans into a chunky puree. 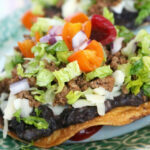 Add a large dollop of black beans to the center of each tostada shell and spread to the edges. Sprinkle with Monterrey Jack cheese and top with ground turkey and desired veggies. Serve and enjoy. 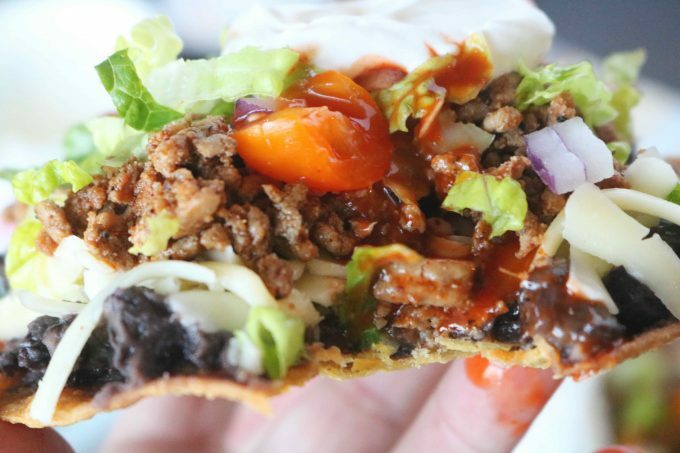 If you are not making homemade tostada shells, use store-bought tostadas.